It is without question that my kids love to eat Asian food. Naturally, being Chinese, it isn't much of a stretch. 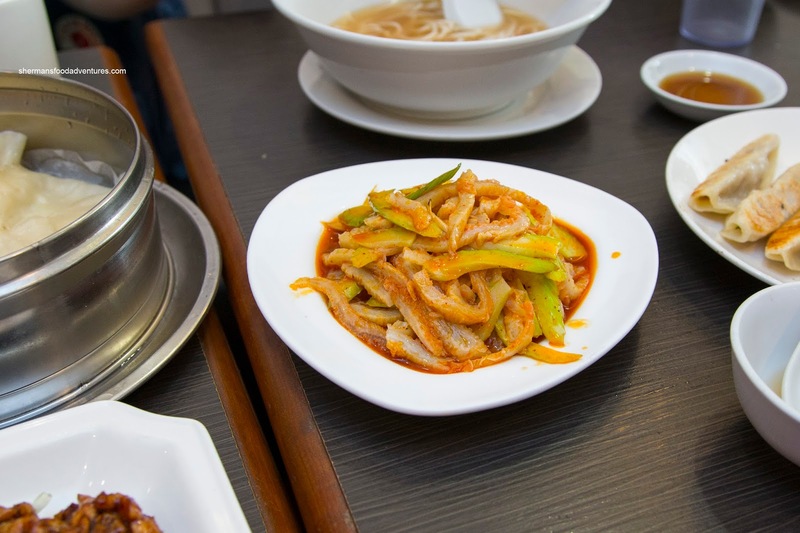 We do expose them to a variety of cuisines, but they keep going back to the well by requesting Japanese, Dim Sum and of course Chinese, but specifically Shanghainese food. Why? 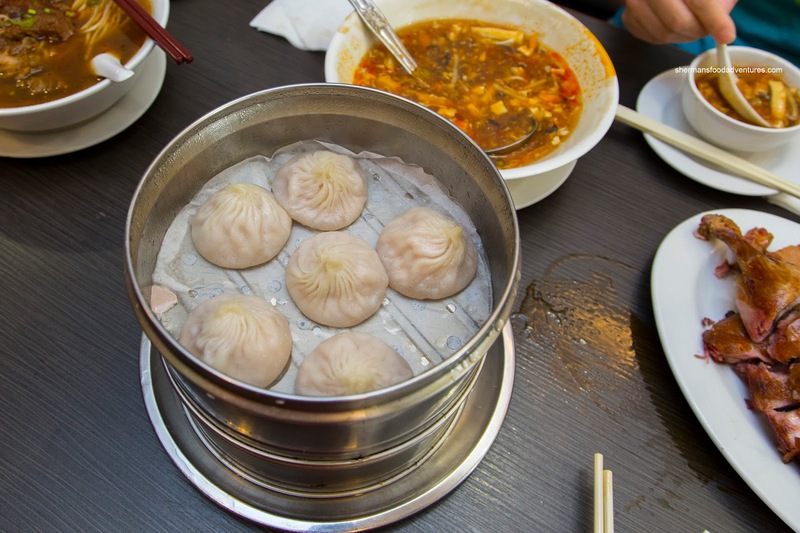 That's easy, the Xiao Long Bao (Soup Dumplings). 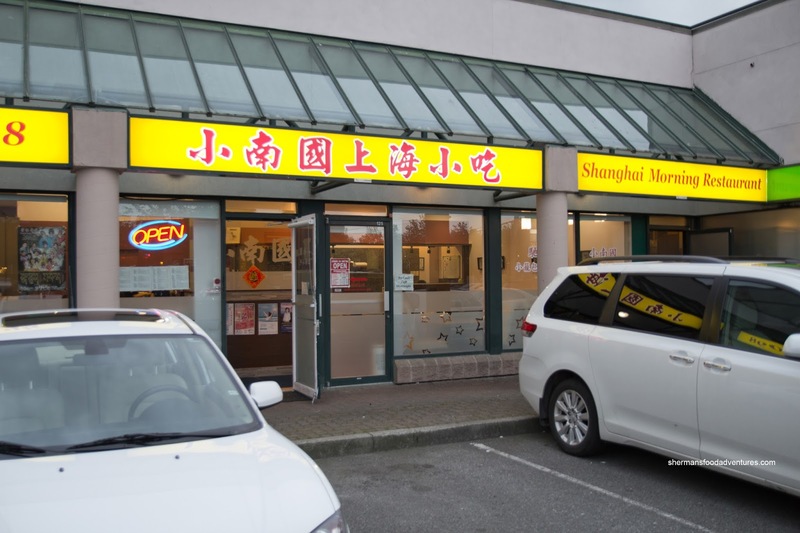 Since we were in Richmond, it was not very hard to find a Shanghainese joint. Hence, we ended up at Shanghai Morning. Okay, the adults weren't super hungry, but the kids were famished. 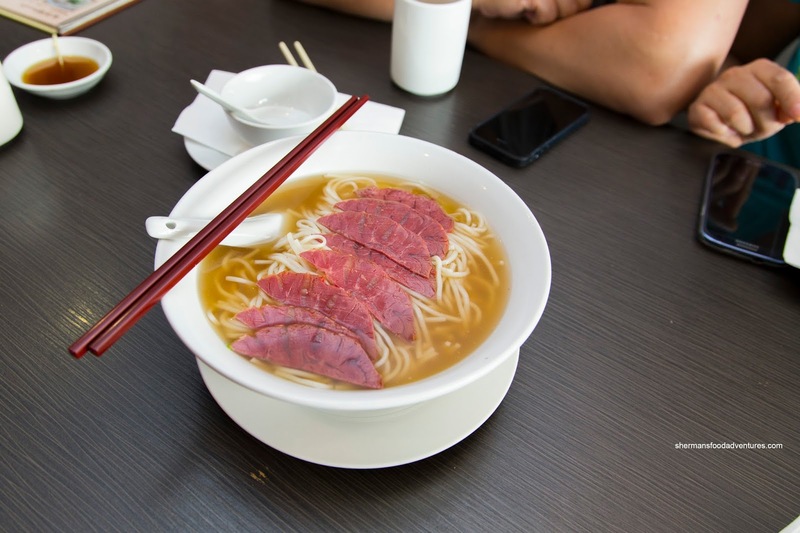 So we were happy that the Beef Noodle in clear soup arrived first. This was a fairly large portion as it seemed like there was an endless supply of slippery and chewy noodles. As expected, the soup wasn't exactly super impactful, but it was mildly sweet with an even amount of saltiness. The slices of shank were really soft and tender where the tendon portions were gelatinous. The adults shared the Spicy Beef Noodle which only exhibited a muted heat level. 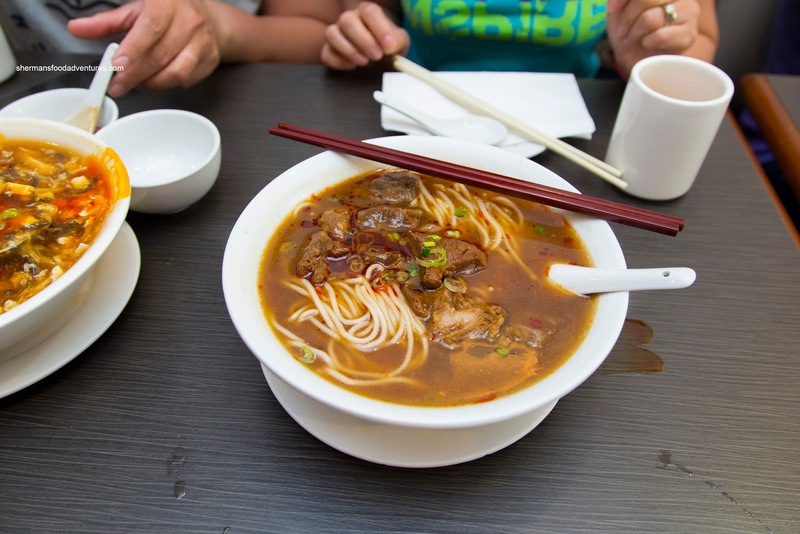 With that being said, the broth was fairly flavourful while the meat was tender and fatty. 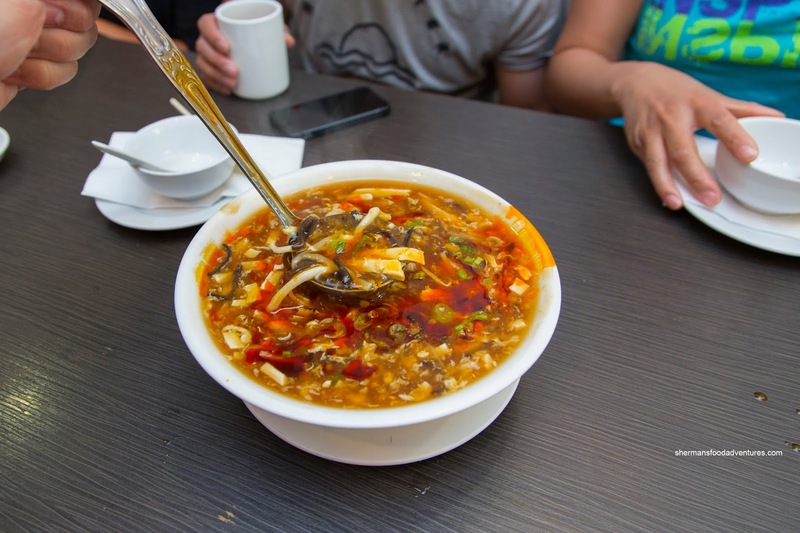 Also mildly spicy, the Hot and Sour Soup was serviceable. I found that the amount of ingredients were modest especially in the meat department as there were no shrimp either. The viscosity was on the thinner side, but hardly watery, but the lack of meatiness meant the soup wasn't robust. There was certainly enough tanginess to go along with the chili oil though. 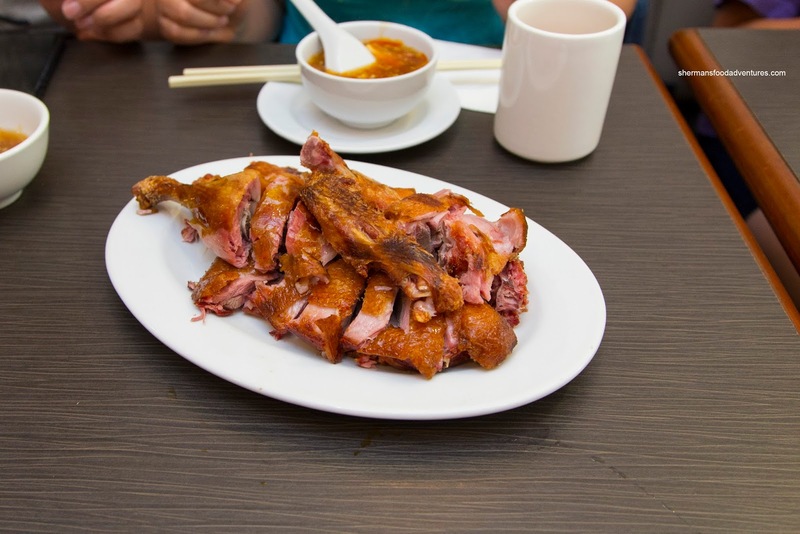 Sporting crispy skin, the Smoked Tea Duck was on point. I found the meat succulent and appealingly salty. As much as the skin was a bit fatty in parts, most of it was crispy and not overly greasy. We then moved onto their Xiao Long Bao, which I've tried many times in the past. As much as they aren't my personal favourite, they are still solid in my books. They featured a thin dumpling skin while only a touch thick at the top twirl. As mentioned in the past, the skin ends up to be a bit more wet due to the metal steamer, so there was less chew. There was ample amount of soup that was well-balanced while the meat was on the grittier side. Sporting an appealingly browned bottom, the Potstickers were on point. 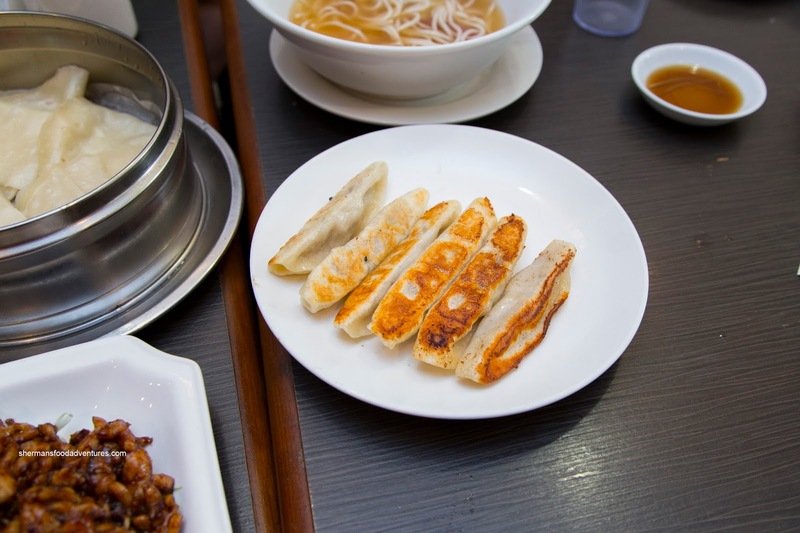 The chewy semi-thick skin was not doughy at all while the filling was juicy and well-seasoned. 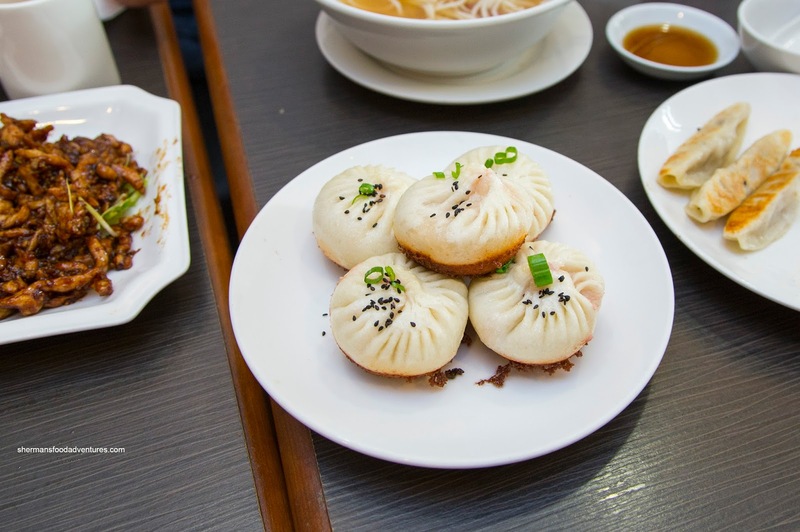 To complete the dumpling trifecta, we got the Pan-Fried Buns as well. 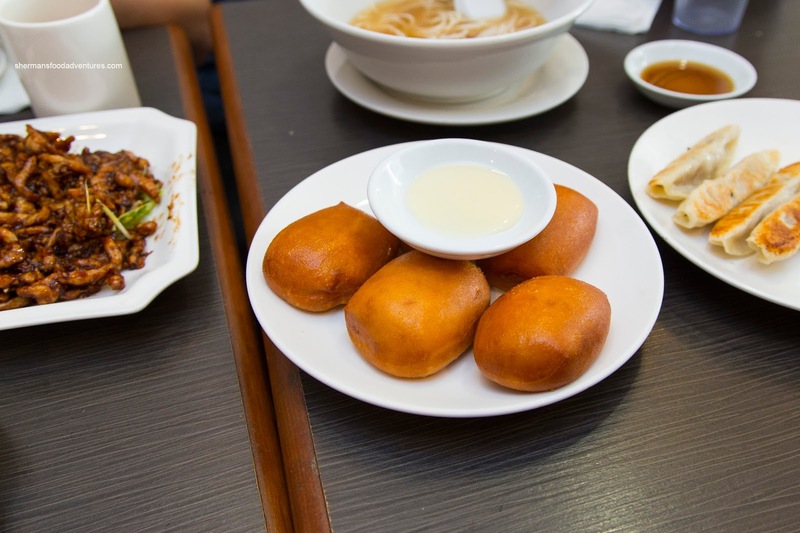 These were fluffy with more bun than filling. The bottom was nicely seared and slightly crispy which meant there was a certain smokiness. The meat filling was similar to the XLB being a touch gritty but still tender and juicy. Despite this, I would've liked to see more filling though. For myself and Costanza, we got the Spicy Tripe with celery. This wasn't really all that spicy, but it was well-seasoned though. 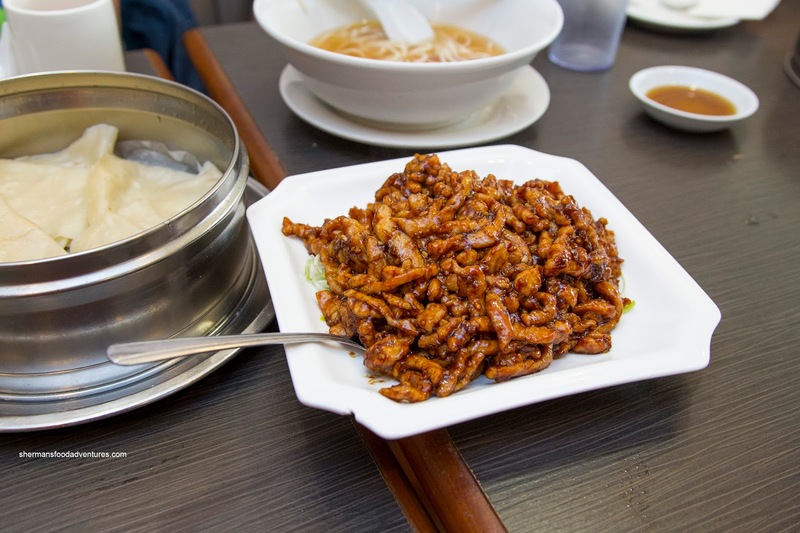 We found the tripe to be buttery and tender with only the slightest of chew. Love the crunchy celery that was mixed in. For the kiddies specifically, we got the Stir-Fried Shredded Pork with crepes. This was as close to their beloved Peking Duck as we got for this meal. It sported tender and almost bouncy julienned pieces of pork that were coated with just enough sweet glaze. The real star of the dish were the thin and softly chewy crepes which held everything in without being dried out. Lastly, our obligatory veggie dish was a fail as the Ong Choy with fermented tofu was as greasy as a pubescent teen's forehead. It was practically inedible as the sauce was more oil than tofu. 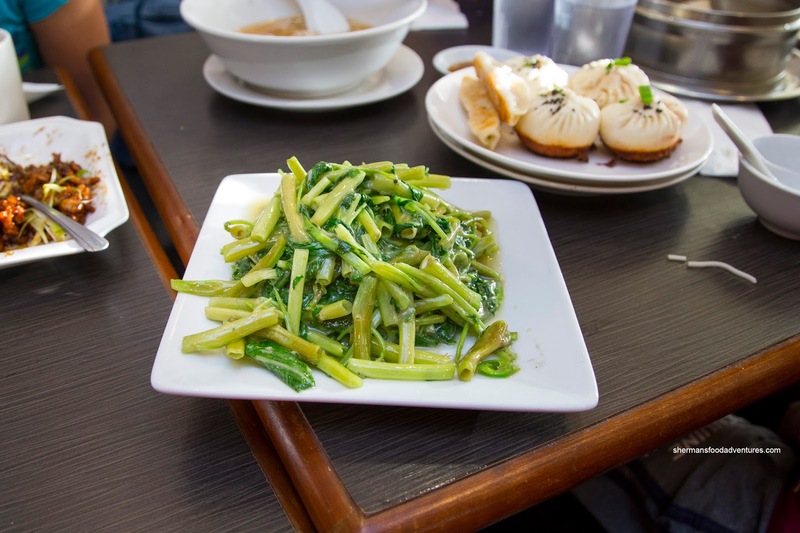 At the very least, the choy was crunchy still. For dessert, we got the classic Deep Fried Mantou with sweet condensed milk on the side (well on top in the picture). I liked how these were the smaller bite-sized version as there was a uniformly crispy exterior. The larger version (which is sliced after frying) falls apart too much for my liking. Ultimately, this return visit to Shanghai Morning was decent and well-priced. I would say that Shanghai River and possibly Suhang are better, but they cost more too.